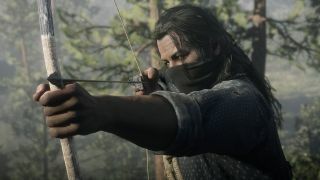 Everything Rockstar's publicly shown of Red Dead Redemption 2 so far has been cinematic cutscenes or standard third-person gameplay, but you'll be able to play the entire game in first-person mode too. Rockstar showed off the view mode during a lengthy play session with us, and though it didn't dwell on the detail long, it should make a big difference in how it feels to live the outlaw life. In the demo we played, first-person perspective could be cycled into and out of like any other camera mode. You're free to just pop into main character Arthur Morgan's eyeballs every now and then, or spend the whole game in there if you'd like, with the exception of cutscenes. Though it would be pretty funny if you just kept making uncomfortable eye contact with the other characters after the camera was supposed to pan away dramatically. Rockstar's last big game, GTA 5, has a first-person mode as well, added for the PC, PS4, and Xbox One versions. GTA 5 launched without it on PS3 and Xbox 360, but it looks like Rockstar has embraced first-person mode as a recurring feature in its approach to open world games (along with drunken fistfights and getting chased by the cops). The company didn't specifically say so, but it seems reasonable to assume that you can play Red Dead Online in first-person mode as well, just like you can in GTA Online. Make sure you read through our extensive Red Dead Redemption 2 hands-on for more details on the game's reactive and surprising world, including how to make friends with your horse and why you should be careful about who you pistol whip. Find out more about the western open-world with this tour of Red Dead Redemption 2's towns.